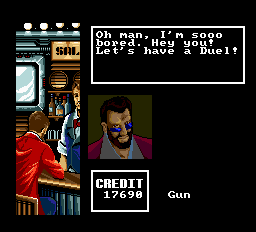 Out Live is a role playing game for the Turbografx-16. 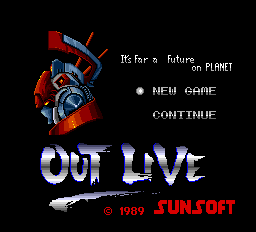 Out Live is a 1st person dungeon crawler in which the player controls an FW - Fighting Walker, the mech of this game. 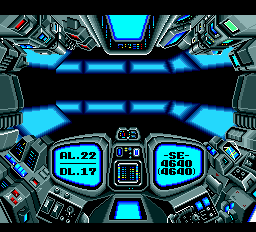 You start your journey on planet Lafura (you’re investigating your friend’s disappearance) with 1000 credits, 1000 life units and a vulcan gun. You can as well talk to people at the bar to learn some info. Once you’re ready, it’s time to go out and do some fighting. You travel along 3D tunnels with a smooth animation and will rapidly encounter enemies.The game stops at that point and switches to a turn-based battle. Win, and you will get money and experience. A password mode lets you save your game. Good luck, and have fun! 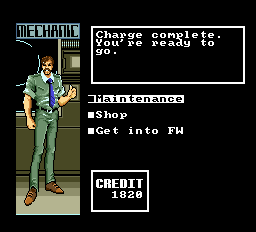 1) Use the name of your mech when you input the password, otherwise the password won’t work! To put it simple, the name is a part of the password and should be the same. 2) This game has a graphical glitch on the last boss screen (and possibly in some other place we aren’t aware of). You can trigger it by accessing the status screen during the battle, and it’s not gamebreaking to our knowledge. 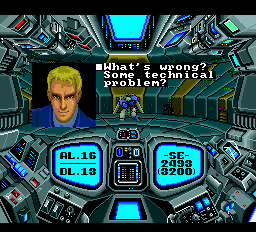 We’re not sure whether it’s an emulation glitch or not, so we left it as is. If you experience it on some emulator, or have a save where the original game works correctly and our translation doesn’t - please let us know.